Play, Eh! Help Us Redesign Our Eastern School Yard! 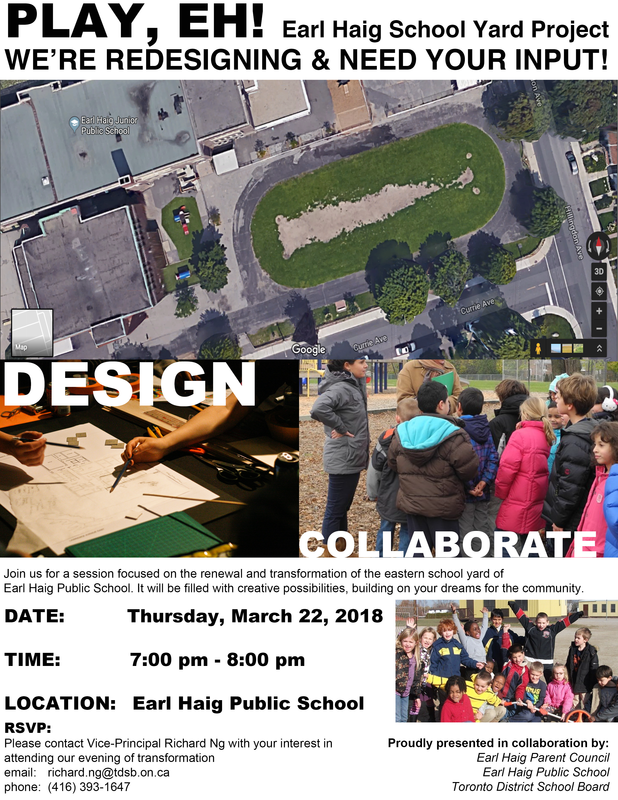 Before our Earl Haig community heads off for a fun and safe March break, we wanted to make sure you knew about an upcoming meeting about our very exciting eastern school yard redesign. Please join us for this collaborative session focussed on the renewal and transformation of our eastern school yard. We want to hear your input and creativity on how to redesign the best possible space for our school and community! The meeting runs from 7:00 – 8:00 PM, on Thursday, March 22nd, at the school. Please RSVP to Vice-Principal Richard Ng if you are able to attend. Next Next post: Let’s Go, Marlies!